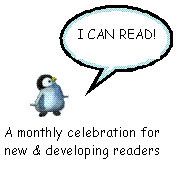 This month I'm hosting the I Can Read Carnival meme. For more about this monthly meme, visit Scrub-a-Dub-Tub. If you've reviewed easy readers or illustrated chapter books in the past year or have written a post about encouraging beginning readers, please leave a link in the comment section and I'll add it to the end of this post. I'll keep comments open until Friday. My post focuses on sight words and introduces the first book my daughter read by herself. Thanks for stopping by, and I hope you'll consider joining the March I Can Read Carnival! Even though my daughter's class spends most of their time concentrating on phonics, the sight words are also important because they provide a foundation of sorts for a beginning reader. Sight words are high frequency words and words that a reader cannot sound out. The reader is expected to know them immediately on sight. My daughter can name all 37 words already and is well on her way to becoming a strong reader. At the beginning of the school year she really didn't have much interest in trying to learn to read because every time she opened up a book and saw all the words, she seemed overwhelmed and was afraid of failure. I didn't push it much and just kept reading aloud to her, pointing out words along the way and sometimes reading more slowly than normal. Knowing some sight words helped boost her confidence. Then right around Christmas things finally clicked with the book, My Dragon and I. The paperback book, My Dragon and I, by Maria Fleming, tells the story two unlikely friends. A girl and her green dragon do everything together. They swing, slide, hop and hide. They even read books together about knights and dragons. The text focuses mainly on four sight words: my, and, I, like. The four sight words appear in bold throughout the book. The easy to read sentences use lots of repetition and rhyme. Most importantly, at least in my daughter's opinion, the illustrations by Mike Gordon are eye-pleasing and cute, making the book fun to read. The back of the book includes a sight word review and other activities to help the child recognize the sight words. 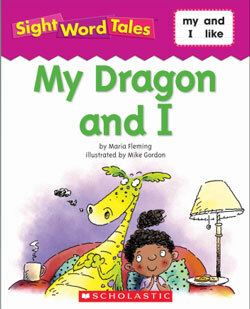 My Dragon and I (ISBN 9780545016483) is part of the "Sight Word Tales" set of paperback books published by Scholastic. I bought an eight book set for $12 from one of the Scholastic Book Club Flyers the teacher sent home and the books have been pretty popular with my daughter because of the fun illustrations and easy-to-read text. Each book features four different sight words and has colorful, often humorous illustrations and lots of picture clues. Never underestimate the impact of quality illustration and a good story when choosing beginning reader books. Kids want to read books that are attractive and interesting, and beginning readers are no exception! The other books in the Sight Word Tales set I bought include: The Fix-It-Up Fairy, Look At That Cat, Oodles of Noodles, A Book With A Pig, Come to the Zany Zoo, Can We Get A Pet? and A House For Mouse. You can also purchase a larger set that includes all 25 books in this sight word series. Preview the full text of all the books by visiting the Scholastic Teacher Express website. What was the first book your child read by herself for the first time? Do you have a favorite beginning reader series? Great Kid Books - Mary Ann reviews a book that "celebrates the love of reading" -- How Rocket Learned to Read by Tad Hills. Her post also includes a review of the ipad app for this title. Additionally, for those just starting to read, Mary Ann recommends the Now I'm Reading series, by Nora Gaydos - published by Innovative Kids. Happy Birthday Author - In another delightful author birthday celebration post, Eric highlights a favorite beginner reader series, Biscuit: My First I Can Read Books series by Alyssa Satin Capucilli. Imagination Soup - Melissa's family learns about word families with the fun Flip a Word Books published by Blue Apple Books. The books are "colorful, bold, and absolutely perfect for learning to read and learning word families." Melissa offers some great sight word learning tips and suggests creating a word wall to practice sight words. On her other blog, Bookmarkable, Melissa lists a few 2010 Early Chapter Books including Extraordinary Ernie & Marvelous Maud by Frances Watts, illustrated by Judy Watson; Number One Kid (Zig-Zag Kids) by Patricia Reilly Giff, illustrated by Alasdair Bright; Princess Posey and the First Grade Parade by Stephanie Greene, illustrated by Stephanie Roth Sisson; and Aggie the Brave by Lori Ries, illustrated by Frank Dormer. Storied Cities - For books set in the city, Storied Cities always has the best suggestions. Look there for a great review of the easy reader series, High Rise Private Eyes by Cynthia Rylant. Monkey Poop - Monkey Poop is a new-to-me book blog and it certainly has an unusual name! Amitha shares books from her latest library visit, plus she writes about a beginning reader book she recently bought for her child, Ducks Go Vroom (Step into Reading) by Jane Kohuth and illustrated by Viviana Garofoli. Scrub-a-Dub Tub - Terry's post is positively pink with Pinkalicious I Can Read! series books. She reviews two books -- Pinkalicious: Pink around the Rink and Pinkalicious: School Rules, both by by Victoria Kann. She writes, "Girls who loved listening to other Pinkalicious stories will jump at the chance to read a new, original story on their own." The Cath in the Hat - Catherine chimes in with her interview of Jacqueline Jules, the author of Zapato Power: Freddie Ramos Takes Off, the CYBILS 2010 Short Chapter Books award winner. Jacqueline Jules is a teacher and librarian and says that, "Freddie is a composite of the students I taught when I worked as a school librarian." Jean Little Library - Spring is in the air, and Jennifer introduces her readers to a picture book about seeds perfect for beginning and intermediate readers -- Planting the Wild Garden by Kathryn Galbraith, illustrated by Wendy Halperin. Looks like a cute book. My daughter is LOVING the Bob books I just picked up for her. I'll look through and see what posts I have to contribute. Thanks for a great post, and a great kick-off to the carnival! 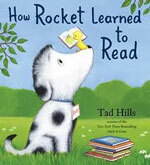 This month, I have a review of How Rocket Learned to Read, both in the book and iPad app form. Cool idea for a Carnival! I thought about all my posts and the best fit would be about Alyssa Satin Capucilli. She is author of Biscuit which are early readers. Wow! We're already off to a great start. I've gone back into the archives for something pink: Pinkalicious! Thanks for hosting and congrats to your daughter! All those wonderful books to read ahead of her. I'm envious. The Elephant and Piggie series by Mo Willems is my favorite for children just starting to read. Wish they had those books when I was a kid! My post for the carnival is an interview with Jacqueline Jules, 2010 CYBILS winner in the Short Chapter books category. Somehow I missed this post in my reader. Thanks for a great carnival. I'm off to visit the links.